The spring equinox, this year is March 20, and is much more than just the first day of spring. In some cultures, it is a day to celebrate traditions and rituals to welcome the new season. In Mexico, there are many festivals that take place to commemorate the inauguration of spring. One of the most popular sites which tourist and locals flock to, during this time of the year, is the favored Mayan ruin: Chichén Itzá. Which is one of the Seven World Wonders, located in the Yucatán Peninsula. Chichén Itzá, one of the most visited archeological sites in Mexico, and was built by the Maya people, between 750-1200 A.D. There are several monuments to admire at Chichén Itzá but the most well known is El Castillo, also known as the temple of Kukulcan. This prominent pyramid reigns in the center of Chichén Itzá and is the location for sightseers to gather during the spring and autumn equinox, to revel in the mystical phenomenon and to observe an astounding spectacle during the season change. During the equinox, the effect of sunlight and shadow create an illusion of a serpent slithering along the steps of the temple of Kukulcan. The simulated mirage is visible for a few days but is most noticeable on the day of the equinox. Visitors are impressed by this exhibition. 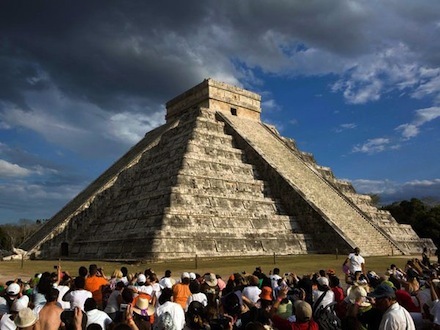 In addition, it is customary for many to believe that during this time, the pyramid radiates a special Mayan energy, which people hope to absorb while observing this awe-inspiring moment. One which all should experience once in their lifetime.